Prepare Quinoa according to package instructions. For Bob’s Red Mill – I didn’t need to rinse it first – yay! Bring 2 cups of water to a boil in a 2 quart sauce pan. Add 1 cup Quinoa, bring to a boil, cover, cook over medium heat for 12 minutes or until Quinoa has absorbed all the water. 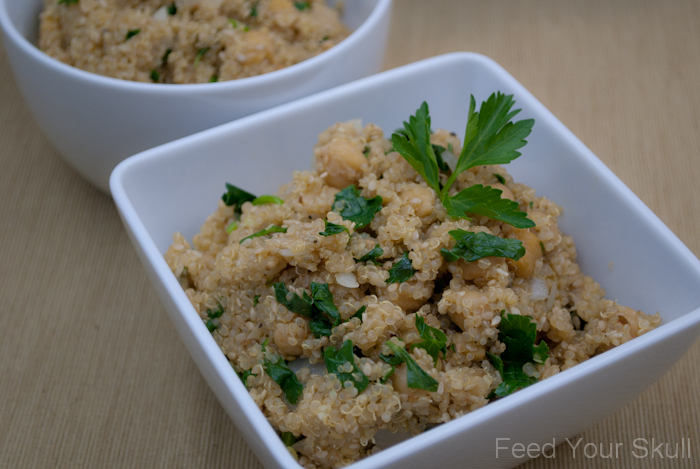 Add chickpeas to the top of the quinoa in the last few minutes of cooking, just to warm up. Add olive oil, onion, garlic, and sesame seeds - stir well and saute for 2 minutes. Mix in remaining ingredients and remove from heat - allow 10 minutes before serving for flavors to mingle and spices to open up.